To maintain a healthy heart, it is essential to lead a healthy lifestyle, but unfortunately today’s lifestyle is not quite as healthy as it is required to be. 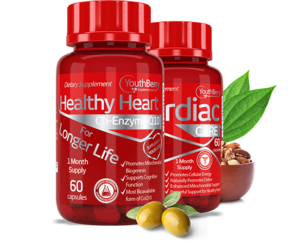 Therefore, we have YouthBerry’s Heart Health supplements. These supplements provide the complete care required to maintain a healthy heart. Loaded with essential nutrients, Heart Health is the way forward to a strong heart. 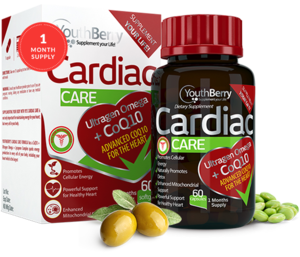 YouthBerry’s Cardiac Care formula has a CoQ10 + Ultragen Omega + Lycopene Complex that sparks energy production in every cell of your body, including your heart which is the largest energy consumer in your body. Supplementing your body with YouthBerry’s Cardiac Care is not only important for maintaining energy for your heart, but every cell in your body. 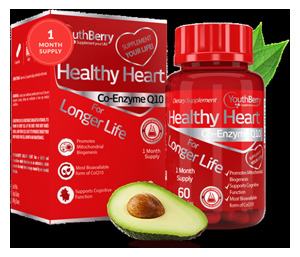 Coenzyme Q10 is a substance similar to a vitamin, it is found in every cell of the body. Your body makes CoQ10, and your cells use it to produce energy your body needs for cell growth and maintenance.